We've looked at the Standard version of the second release of Adobe's Production Studio. 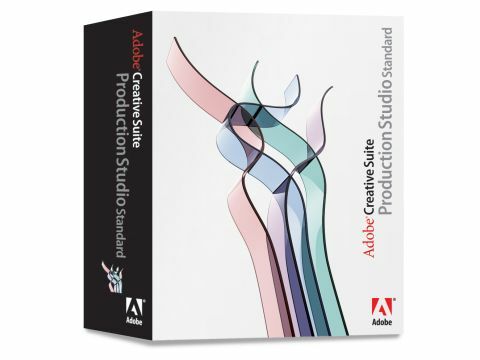 The latter bundled Premiere Pro, After Effects and Photoshop CS2 into a single package, and combined them with the new Adobe Bridge software designed to manage the vast number of files created by any desktop video project. For an extra £500, you can get the Premium edition which provides everything in the Standard package along with three other elements: Encore, a DVD authoring program; Audition, for editing and mixing audio; and Illustrator, for vector graphics. In addition, there's the Pro version of After Effects which adds the advanced keying, extra filters and motion tracking tools missing from the Standard version. The Premium Production Studio is aimed at those needing to do complex video effects, those who produce professional DVDs and those who need to mix, re-master and restore things such as sound. Effects filters only available in the Pro version include a more in-depth lightning generator capable of creating lightning which sticks to objects on screen and which arks from one point to another. There's also a glow filter and some distortion filters most of whose effects can be approximated with the Liquify tool in the standard version. In addition are a few filters that enable After Effects to take depth matte information (usually generated by 3D packages) and use it to create effects like focus, fog and masks. The ability to paint directly on to individual frames or sequences is another feature of After Effects Pro, and although it stops short of the level of control you'd get in Photoshop or Illustrator, paint strokes are animatable and you can create them using a graphics tablet if you have one. Particle systems are also included. Although they let you specify objects as particles and apply some quite complex motion, they're nothing like as advanced and easy to work with as those in Autodesk's competing package, Combustion. After Effects particle system is due for a makeover and it's rather a pity it didn't get one in this release. If you're working with very complex, high quality projects, there's also support for 32-bit HDR and 16-bit colour, optics compensation and the option of importing camera movement from 3D packages. Keying is augmented in Pro with a Matte choker for improving the quality of the edges of keyed objects, a spill suppressor for reducing blue or green fringes and additional tools for animating drawn masks. Again, After Effect's Keyer is strong, but Combustion's is far stronger. An animation tool called the Wiggler is also included in After Effects Pro. This is very useful for automating animation, allowing you to select any two key frames, and instantly produce random variations between them. With the Wiggler, you can simulate an earthquake, make a light flicker, create a swarm of insects, or make a character wave. There are a few new specialised tools included in After Effects Pro for the first time. The first is the Timewarp filter - which allows you to animate the speed of a clip, slowing it down, speeding it up and even reversing it smoothly. Timewarp uses morphing technology to create new frames when a clip is slowed down so that even very slow moving shots are smooth and fluid. It can make mistakes at very slow or fast speeds causing a surreal warping smear effect, but if your footage is decent and you don't expect the impossible, results are generally very good. Encore offers a lot more than your average DVD program. It's not just a series of preset menus, but a complete authoring package. Version 2 is a substantial update (more substantial than that of Premiere or After Effects) and the package now includes a flowchart view for managing cumbersome projects. This allows you to see exactly which menus, submenus and videos you have in your project and displays the connections between them as arrows. The flowchart view makes it very obvious if you've forgotten to add 'back' and 'forward' buttons, or left video items or menus unlinked to the rest of the production. You can also create buttons and links by dragging from one flowchart icon to another; to produce new menus, you drag graphics files on to the flowchart view. In other words, you can build a DVD just by dragging and dropping onto the flowchart if you feel most comfortable working that way. There's now a new tool for creating quick and easy slideshows from collections of still images. You can simply drag in a selection of pictures either from Bridge, or directly from the desktop and arrange them in order. You can then add background audio (although you can't narrate it as the slideshow plays as you can with packages like Pinnacle Studio), transitions and pan-and-zoom effects to add a bit of motion to the still images. Graphics and buttons from the built-in templates can now be mixed and matched in your own productions, allowing you to, for example, take the background from one template and the buttons from another to produce your own look. Premiere's audio tools are pretty good and include a range of effects and mixing tools. However, if you really want to get to grips with the audio of your projects, Audition provides you with a complete multi-track mixing environment. You can layer audio files to your heart's content, adding effects, editing waveforms and synchronising sound as you go. With each effect being controllable on every track, there's enough flexibility for any musician. However, the package is also aimed at the videographer and has the ability to import video files to play while you work with the mix. In the new version, you can record any changes you make to the volume, stereo, or effects settings of any track as it plays, so the system becomes like a live studio. You can also work with more video formats, bringing in clips, synchronising effects or music to video, watching the results live and then recording the new audio back into the original video file without affecting the video content. Audio restoration is another strong feature of Audition. If your sound isn't up to scratch to begin with, there is a range of analysis tools to help you find out exactly what's wrong and fix it. That said, this is a specialist job and you shouldn't expect to be able to just run your low-grade camcorder footage through it to produce film-quality surround sound. There are no one-button solutions here, so you should expect to put as much time and effort into learning to mix as you put into learning to edit. Illustrator really is the industry standard in vector graphics, making it ideal for use in postproduction. By drawing lines and shapes - either freehand or one point or curve at a time - you create objects which can be filled with gradients and colours, and moved around independently. In other words, when working with Illustrator any part of any drawing you produce can be re-arranged at any time and can be scaled up or down to any size without losing quality. This makes it an excellent tool for anyone designing animations, graphics or title sequences. You can create a character with its arms and legs as separate objects, then re-pose that character very easily to create frames and loops within Illustrator or to produce layers for After Effects projects. In addition, because vector graphics are scalable, you can use them just as easily in low bandwidth web design, in video or in high quality print work. The new version includes Live Trace - a great way to turn sketches into instant graphic illustrations which can then be painted, edited and worked on within Illustrator. The Premium version of Production Studio is a good step forward from version 1. The reworking of the interface for After Effects, Premiere Pro, Encore and Audition has made all the packages easier to work with. You can now switch between focusing on the monitor screen and on the timeline, asset library or animation controls. Adobe Bridge is an interesting development in terms of asset management and it does allow you to switch easily between packages. However, right now it's limited. There's a lot of room for improvement here and we should expect to be able to automate and access a lot more of Production Studio's tools through Bridge in the future. Network rendering, batch processing and versioning are all functions Bridge could usefully take over when it becomes a fully developed package. The most compelling reasons to go for the Premium version of Production Studio over the Standard package are After Effects Pro's additional features and the updates to Encore. Audition and Illustrator can both be purchased individually and although they've changed, they haven't grown massively in this release. If you don't author a lot of DVDs and shy away from high-end effects, you're probably best off sticking with the Standard version. For everyone else, there really is no other package like this around.